Bulgari Residences Dubai ... a rendition. 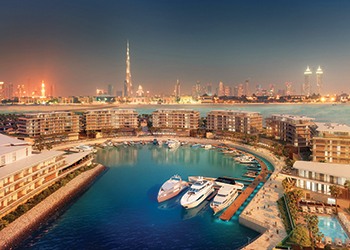 Dubai’S Meraas has unveiled the Bulgari Residences Dubai as part of the 1.7-million-sq-ft Bulgari Resort and Residences that is taking shape on the Jumeira Bay Island of the coast of Dubai in the UAE. Bulgari Residences Dubai will be the first-of-its-kind master development in scale and magnitude, offering efficient living spaces with the luxury brand Bulgari’s signature style evident in every detail – whether inside the home, in the common areas or within the wider community. Comprising 165 apartments, eight penthouses and 15 mansions, every unit at the development will offer magnificent views. While the apartments range from one to four bedrooms within six freestanding buildings, the mansions offer a variation of three to six bedrooms. In addition to common areas such as private landscaped gardens, swimming pools and gymnasiums, residents can enjoy a host of dining and sporting options on site, including the 50-berth marina and Bulgari Yacht Club and benefit from the unmatched service standard of the adjacent Bulgari Resort. Bulgari Residences Dubai will be entirely designed by Italian architectural firm Antonio Citterio Patricia Viel and Partners. Citterio has handled the architectural and interior design aspects of all the Bulgari Hotels worldwide including the Bulgari Resort and Residences Dubai. His close attention to the smallest detail has helped translate the luxury of the Bulgari brand along with the high quality of a Meraas development. Commenting on the project, Cherif Hosny, chief hospitality officer, Meraas, says: “Bulgari Residences Dubai is not a regular development with branded elements. It is truly the first of its kind created from pre-concept, with the intention of translating the visions of both the primary stakeholders – Bulgari and Meraas – into an extraordinary man-made marvel. The Bulgari Resort Dubai, the fifth Bulgari Hotels and Resorts property in the world, will comprise 101 rooms and suites in the main hotel buildings, as well as 20 hotel villas and a full range of luxury hotel facilities. The resort, also designed by Citterio, will offer a mix of traditional and modern themes through the juxtaposition of new and conventional architecture, aptly reflecting the design and style of the surrounding area. Characterised by its efforts to create perfect harmony with nature through its architectural style, the Bulgari Resort and Residences Dubai aims to seamlessly integrate the physical elements present on the Jumeira Bay Island. And while the ubiquitous use of limestone is reminiscent of the golden sands of the desert, it also harks back to the timeless sculpted architecture of southern Italy. Limestone has also been generously used in the boundary walls of the development, while the podiums are similarly clad in golden limestone. In addition, the lava stone and basalt paving create a sophisticated graphic contrast for public space – that, in architectural terms, makes up the ‘inner’ urban environment. The entire development is scheduled for completion in 2017.